I first heard of St Malo in a French movie “Last Love” starring Michael Cain who plays a reclusive widower in Paris who knows no French. In this film, the main character gives the house he owns in St Malo to his young friend. 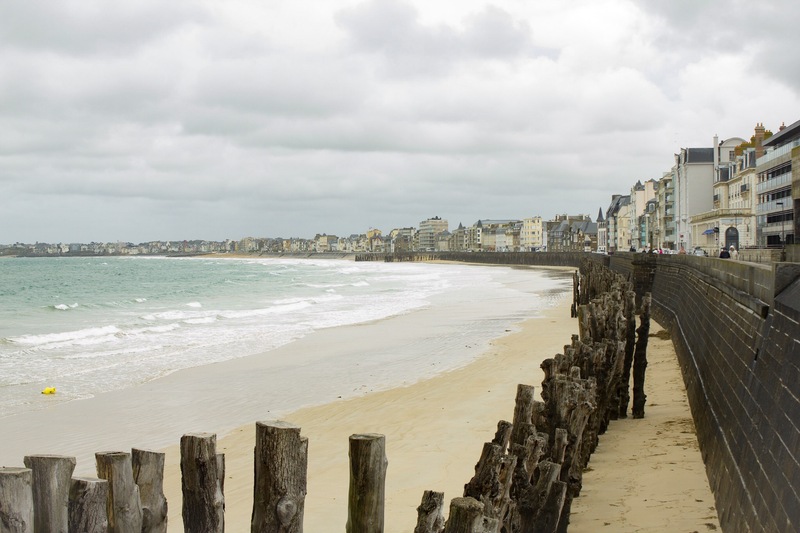 I researched St Malo after watching the movie and virtually fell in love with this cute little coastal town. It feels magical to come here, and talk walks around this massive walled city. The first day I walked around orienting myself in this town and taking count of where everything was. The weather in St Malo is typical coastal weather, it turns from sunny to rainy in an instant. The sky is dramatic with its dark clouds and beautiful sunsets. I appreciate that it’s not too hot or too cold. I am staying at a lovely Airbnb on the 4th floor of a building built-in 1900’s and renovated after. It has skylights instead of windows; it has everything you would need to cook a meal, enjoy a relaxing day reading a book, and a small desk to sit and write. The apartment’s decor was white and gray; it has pictures of St Malo, sunsets, beach, and map of Bretagne region. On my second day I ventured into an indoor french market at 10 am, I saw rows of vendors of cheese, meat, butter, bread, fruits, veggies, tarts, dried fruits and nuts, olives and flowers. It seemed like the entire town was having a social gathering while buying food. The vendors took the time to talk, gave them updates and helped people choose. I picked up some herbed butter, eggs, and veggie pizza tart. Being able to speak a little bit of French helped me order, give the farmer the right change and strike a small conversation. The pies looked like work of art, and they had layers of thinly sliced onions, tomatoes, zucchini, cheese, sesame seeds and rosemary. The farmer told me he read about Oregon in a magazine about their organic growing methods, small farms and environment conservation. He took the time to talk to me even though six people were waiting in line. Everyone seemed to be taking their time and in no rush to get anywhere other than shop for food. Later I spent the day walking around St Malo, watched kids enjoy carousel rides, and people walk hand in hand. I got myself an Americano and sat is a corner of the coffee shop gazing out the window. The cashier and I quickly became acquaintances, we talked for a bit and played different songs we liked to each other. Rhianna was her favorite American singer, and Kenji Girac from France was mine for a little bit. It was fun to hear Afro beats, Edit Piaf and American pop music in a coffee shop. My body and mind felt relaxed in the new environment. I like cities for all the educational opportunities, diversity, museums and architecture. I love countryside as it gives me a chance to slow down, take long walks, let my guard down and relax. As a solo female traveler, small towns and villages felt safer and easier to navigate than the major cities. The French people I meet have been incredibly kind to me contrary to their reputation. Tomorrow I plan on doing nothing but walking and spending hours at a coffee shop doing nothing. It is a gift to be able to spend your time as you see fit doing something productive or nothing. Doing nothing gives me space and time to let things go and live in the moment. Looks like a wonderful journey that you are on. Hi Sydnee! Yeah its been fun to explore new places. How are you doing?